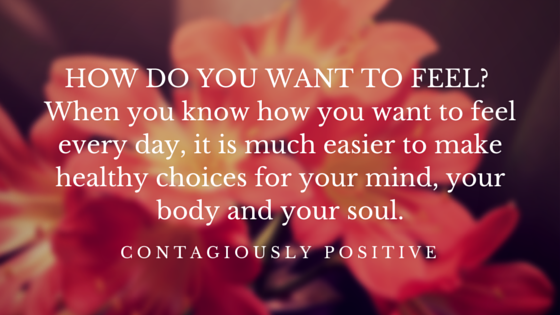 Contagiously Positive » How Do You Want To Feel? Have you ever been asked how you want to feel? Today, that is my question to you. How do you want to feel, every day, all day? I came across this question in Danielle Laporte’s book The Firestarter Sessions and then again when I was going through my Life Coach Training. I thought, this is brilliant! That is the most important we should know about ourselves, and we never get asked it, or ask ourselves. I got out my journal and asked myself, how do I want to feel? Two core desired feelings kept coming up. For me, I want to feel healthy and happy. Those are my two core desired feelings that I’m always working towards. My husband asked me, “isn’t it difficult to make healthy food choices all the time?” The answer is no. Why? Because I know how I want to feel. When I made the choice to take care of my health and started paying attention to my dietary choices, I did it because I was sick and tired of feeling sick and tired. I wanted to feel healthy. In order to feel healthy, I eat the foods that make me feel that way, and avoid the foods that don’t. I focus on how my body feels. My body knows best and will always be honest with me. I have learned how to trust that. The same goes for feeling happy. When I wake up, I think about all the things that I can do to not only make myself happy, but stay that way throughout the day. It truly is my choice on what attitude I choose, so I have to make that conscious choice every single day. If I get cut off on the way to work, if I get bad news, if someone is incredibly rude to me, the attitude I choose in negative moments is what will bring me to an unhappy or happy state of mind. I don’t have control over negative things that happen around me or to me, but I do have control over how I let it affect my inner being – my mind, body and soul. This doesn’t mean being happy when you suffer from a loss or something painful happens in your life. You still want to feel those feelings, but you will know what to do when you are ready to move forward again and get back to living a life based on your core desired feelings. The point of this isn’t to rid yourself, or avoid all negative feelings. It is to make sure that if something negative, or painful does happen, you don’t have to set up permanent residence in that pain and negative state. Simply put, you are not letting it take control of your life. It is all about taking control of your own life and to do that a big step is really asking yourself and getting clear about how you want to feel. When something happens, good or bad, remember that we all have the ability to choose how we will react to any event. With regards to my health, an illness may come, or it may not. I don’t have control over that. But I do have control over what I put into my body right now, today to try and prevent it. I can also control my health by being active. For me, it feels so good to be active, and I feel healthy when I’m moving. So I do yoga, I bike, I walk, or I dance. The whole point is just to move. You don’t need a fancy gym membership for that. When you know how you want to feel every day, it is much easier to make healthy choices for your mind, your body and your soul. So today, get out a pen and paper and answer these two questions. How do you want to feel? What steps can you take, and will you to take, to feel that way? Now get out there and be Contagiously Positive!